The holiday season is the perfect time to wear the most elegant jewelry for all of those special parties, dinners and celebrations. However, many budgets this year (including mine) cannot afford to add extremely expensive pieces to their collections. Thankfully, MemeJewels.com has a wonderful selection of “elegant jewelry at affordable prices.” From bracelets, necklaces, earrings, rings and pendants the jewelry offerings are striking, high quality and well within my budget. 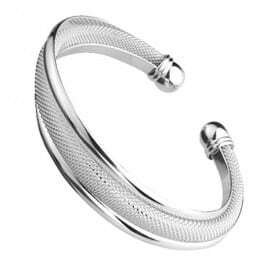 I love sterling silver pieces and the Designer Inspired Sterling Silver Cuffed Bracelet is absolutely stunning and is an exceptional in terms of quality and value. The combination of braided and polished textures on this bracelet makes this one eye catching piece of jewelry. The intricate details including the capped ends are what really make this bracelet a standout. I wore this bracelet to church to accent my simple black dress and it received many compliments from complete strangers. I am very impressed because it definitely feels like I am wearing one of my higher end pieces of jewelry yet it is affordably priced at only $65.95 (regular price $145.99) at MemeJewels.com! What special piece of jewelry do you want to add to your collection this holiday season? The prices at MemeJewels.com are so affordable that you can buy your favorite piece and pick up a second one to give as a gift too. Just look at this beautiful Sapphire Pink Heart CZ Rhinestone necklace….I did a double take when I saw that it is priced at only $29.95. Hint to my beloved husband……this is at the top of my Christmas wish list! You are invited to visit MemeJewels.com to browse the entire collection of high end inspired, affordable jewelry. WOW! Two lucky readers will receive a Designer Inspired Sterling Silver Cuffed Bracelet valued at $65.95 from Meme Jewels! I like the Designer Inspired Sterling Sliver Celtics Knot Ring. My birthstone is Aquamarine, so I like all the jewelry there- It’s beautiful! However, my favorite color is red, so just imagine my face when I came across the Lynda’s Pear Drop CZ Jewelry Set. It’s amazing! I like Betty’s Triple Frosted Heart Sliver Necklace!! it is beautiful, love the hearts!! I like the extra large silver hoop earrings. So pretty! Would be great for my mother! I love the Designer Inspired Heart Chain Bracelet. My favorite is the Designer Inspired Sterling Sliver Textured Cuff Bangle. I love cuff type bracelets and this one is beautiful. My favorite is the CZ Heart Gold Pendant Necklace. I love the heart chain bracelet! I like the Pink Sapphire Sterling Silver Necklace. The Rose Gold Fox Animal Ring is adorable! I like the Blue Chalcedony Stud Earrings. I like the Textured Knot Mesh Sliver Earrings. The Sterling Silver Blue Topaz Three Stone Necklace is beautiful. Thanks! I like the Designer Inspired Sliver Mesh Heart Ring. The simulated Blue Sapphire Stud Earrings are lovely. My favorite is the Designer Inspired Sterling Sliver Stackable Bangle Bracelet. I love the 2ct CZ earrings! I love, love, love the Celtic Knot Ring. I’d get the Silver Tone Aquamarine CZ Ring – my wife’s birthstone. I like the Designer Inspired Sterling Silver celtics Knot Ring . It is simple and elegant. What a gorgeous bracelet! I would love to win it. Thanks for doing this giveaway. I like the Amethyst and Aquamarine Sphere Earring and Pendant Set.